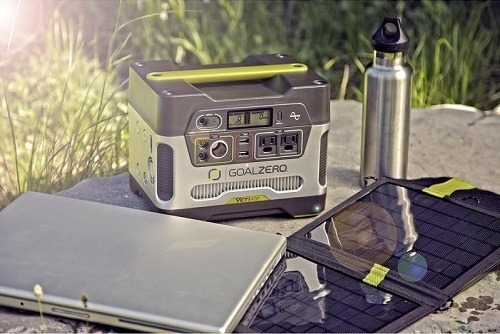 Portable solar generators offer a viable and simple solution for powering devices on the go, keeping the lights on outside, recharging critical devices and providing power in emergencies. The idea of portable generators isn't new, but recent advancements in battery and solar energy technologies have made it cost-effective to use portable generators that run on sunlight alone. We have relied on portable gas generators for years. While effective, fuel-driven generators suffer from a few major drawbacks. For one, gas generators are incredibly loud. And, they require a constant supply of fuel to keep running. If you want to be portable, that means you have to carry fuel in addition to the generator. And wall-socket charged battery packs can keep your power on for a while, but they, too, eventually need a recharge. 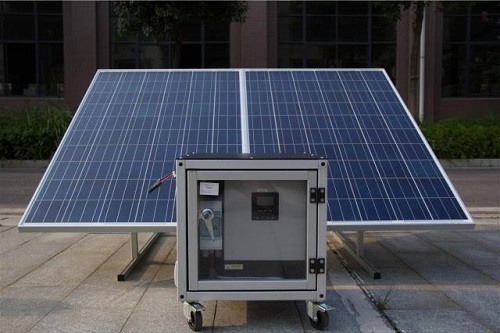 Solar portable generators are completely quiet, require no fuel and can be run indefinitely anywhere there is sunlight. The portable aspect of solar generators cannot be overemphasized. There are plenty of solar generators today that can supply small appliances and electronics with a lot of power and can run for several hours or even days on a single charge. This guide will walk you through what we believe are the 6 best portable solar generator systems sold today. NOTE: Touch a generator name to read the review, to see the latest price touch price. Perfect for: Outdoor, camping, RVs, boats, small appliances, phones. Perfect for: Outdoor, camping, RVs, boats, emergency roadside. Perfect for: Outdoors, Camping, Small Appliances, Cell Phones. Perfect for: Camping, RV’s, Boats, Cell Phones, Small Appliances. Perfect for: Outdoors, Camping, Backup Power, Off-Grid, Small Appliances, Large Appliances, RV’s. Perfect for: Outdoors, Camping, Cell Phones, Small Appliances. GoalZero Yeti 400 is their best-selling of the three and combines the best features of its bigger and smaller cousins. One of the most appealing things about the 400 is the amount of power it packs into its 29 lb. Package. The 400 has a capacity of 33 amp hours (Ah) and can supply 300 watts of continuous power (600W peak). The charger can be charged using the 12v adapter in your car, a wall outlet, and using solar panels including Goal Zero's Boulder panels. There are numerous ports for charging all sorts of devices via the two USB ports, two AC ports, and two 12v ports. 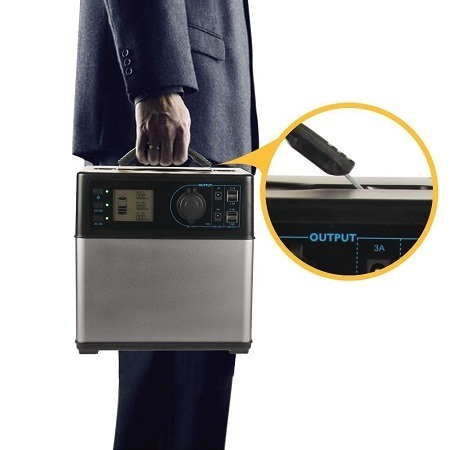 The generator's top handle provides an easy way to carry it around, and the generator is completely silent during operation. The batteries in the 400 are lead acid-based, which are heavier but cheaper to replace than Lithium Ion batteries. The generator's size is a big plus as well. It is fairly easy to haul around to supply power in a variety of situations. The display on the unit provides vital wattage and usage information, and it has a backlight that allows for accurate readings at night or in the dark. The Yeti 400 is powerful enough to provide over 30 charges for a smartphone, and 3-4 charges for a laptop. 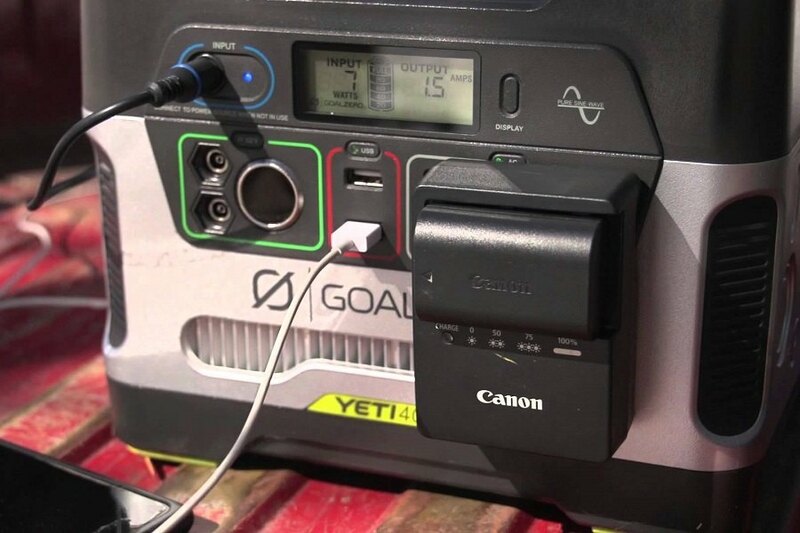 This makes it a valuable ally for extended camping trips or outdoor excursions when you want to make sure your electronic devices remain charged. People on short boating trips, camping or living off the grid for a few days will find this unit can supply most, if not all, of their recharging and lighting needs. Although not powerful enough to run a refrigerator or heater, the Yeti 400 is helpful for powering phones, alarm clocks, and small medical devices such as CPAP machines in the event of an outage. The Yeti 400 is very powerful for its size, but those who are looking for a heavy-duty generator to power things like a standard-sized television or refrigerator need to look elsewhere, as it is really only for medium-to-smaller sized devices and appliances. The lead-acid battery will eventually need to be replaced more frequently than a lithium battery. The Yeti 400 is an extremely popular generator right now, and for good reason. It's the perfect choice for anyone needing a reliable and versatile unit that has enough power to keep electronics charged and small appliances running, and enough storage capacity to handle most outings. Solar panels are sold separately. We recommend GoalZero's excellent Boulder series. 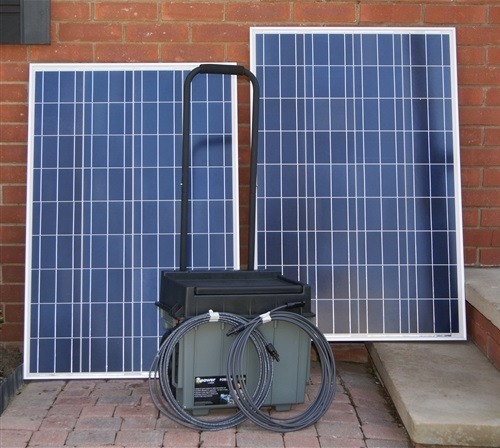 This simple kit from Off Grid Solar Generators is incredibly user-friendly, and comes with everything you need to be solar powered right out of the box. 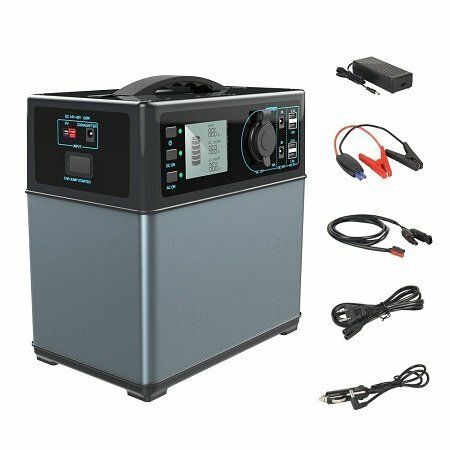 Beginners who are new to solar generators will surely appreciate this kit. 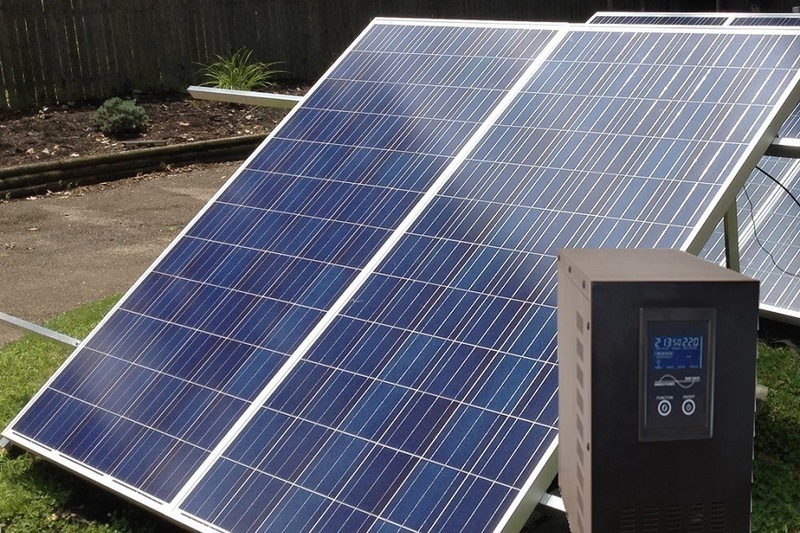 The Solar Plug N' Play Kit offers simplicity first and foremost. Most generators come with just the unit and no panel, but this one includes the solar panel as well. There is no need for a charge controller with this unit either, as the battery takes a trickle charge after it reaches capacity. The panel includes a full 25 feet of cord, which allows you to charge in full sunlight with enough room to move your unit and electronic items to the shade. The power pack itself is made by Wagan, with a rating of 20Ah. The unit contains three separate three-pronged AC outlets, along with one DC outlet. Like the Yeti 400, this unit is relatively light for the amount of power it provides, coming in at just over 30 lbs. The powerpack itself includes a handle for easy carrying in most scenarios. Don't expect to power something like a microwave or small refrigerator with this unit. The power provided from a full charge is better suited for smaller items such as cellphones, lights, and CPAP machines. Laptops are appropriate as well. This unit is good for camping trips, or anywhere you may find yourself off the grid for any amount of time and still wish to power some small items continually. Although the unit has an AC charging option, the fact that it comes with its own solar panel is helpful for those wanting an all-in-one package. People wanting to power higher-wattage items like coffee makers and space heaters will need to look elsewhere. The solar charging can take a significant amount of time for a full charge as well, sometime as long as 36 hours with partial sunlight. The lack of USB ports might be a negative for many users as well. This kit is extremely simple and safe to use, and should be user-friendly enough for any novice. The included solar panel saves you the worry of having to find a compatible model on your own as well, and you can be comfortable leaving the unit charging due to the trickle charge when it's full. If you are okay with powering or recharging some low-wattage devices once per day, than this kit is perfect for you. Proper expectations can lead to a better user experience, so as long as you know what you're getting, you won't be disappointed. 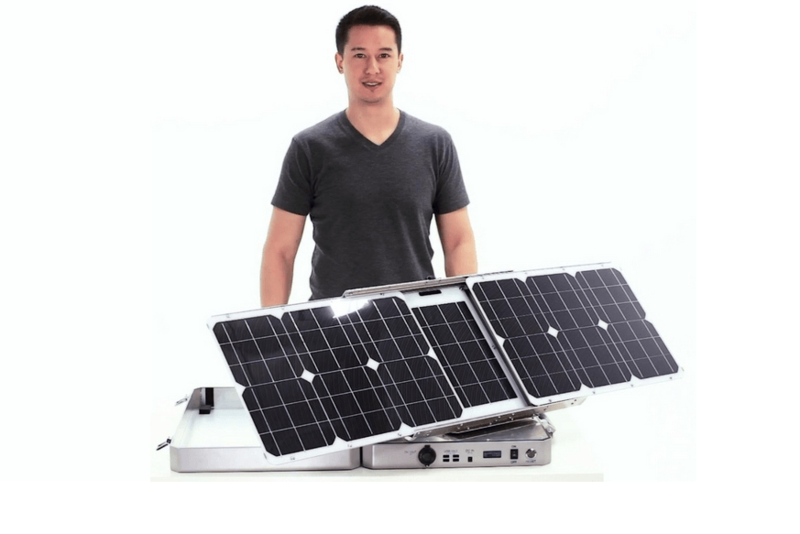 It doesn't really get more portable than this "briefcase" solar generator from Aspect Solar. 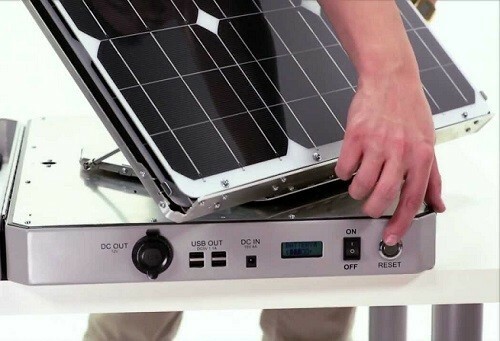 The Sunsocket comes complete with solar panels that fold out automatically when you open the case. The solar panels track with the sun, automatically. The biggest feature of the Sunsocket is the design. 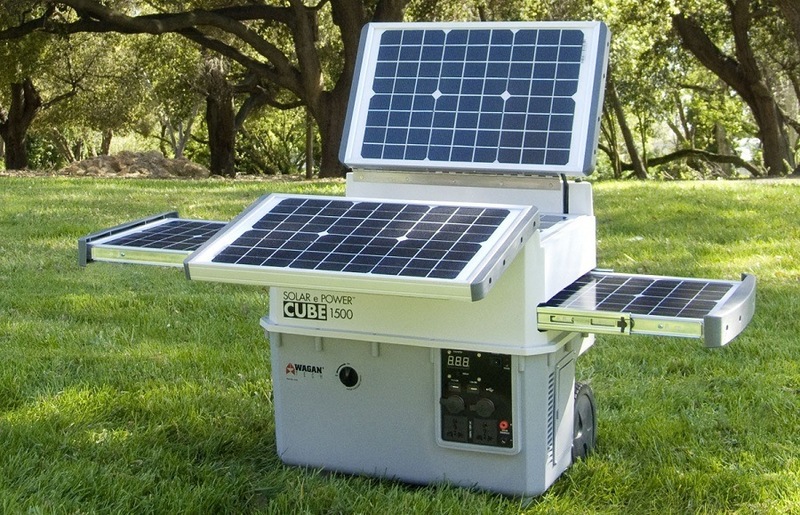 When closed, the unit measures a tiny 20.2 x 4.2 x 16.5 inches and weighs 25 lbs, which is in the low end of the weight range for portable solar generators this size. Everything folds up nice and neat into a briefcase with a handle to carry it. Really nice design. Set up is incredibly easy – just open, pop out and set up the panels, and the unit is ready to charge from the sun via the 60 watt solar panels. One major advantage of these panels is the fact that they track the sun as it moves across the sky, saving you from having to constantly adjust the angle. The Sunsocket lets you to just set it up and leave it be. You can even charge from the battery with the panels stowed away. The unit's 250 watt battery charges fully in 5 hours of direct sunlight or in 9 hours in cloudy conditions. 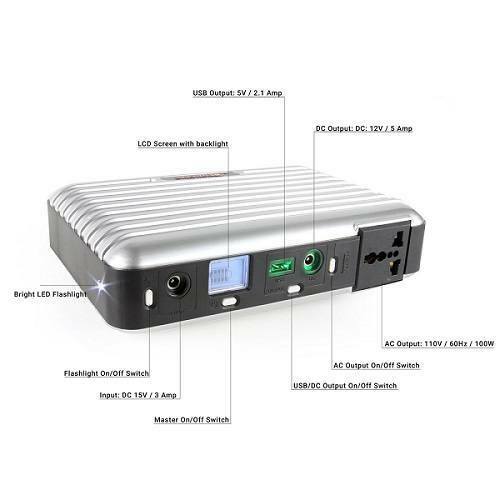 Power output is delivered via 4 USB outlets, a 12v DC outlet and a standard AC plugin. 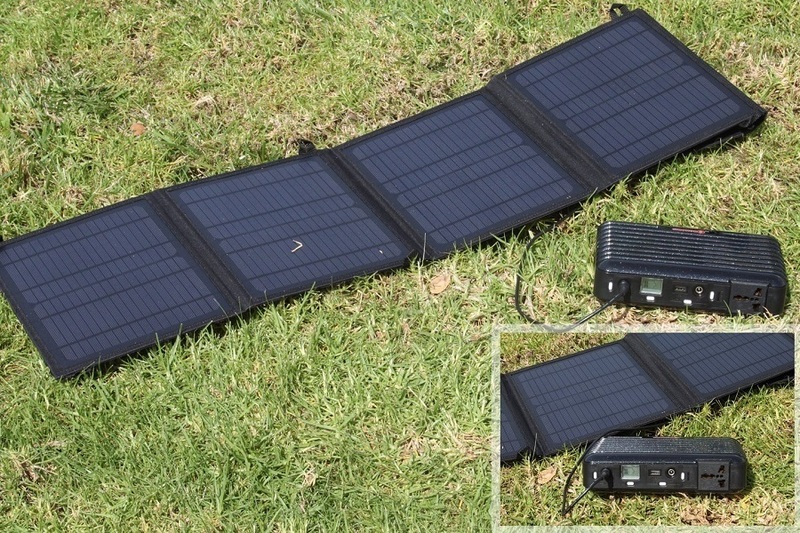 The Best Portable Solar Generator Yet? The Sunsocket's easy-to-use design makes it perfect for all sorts of light use applications. 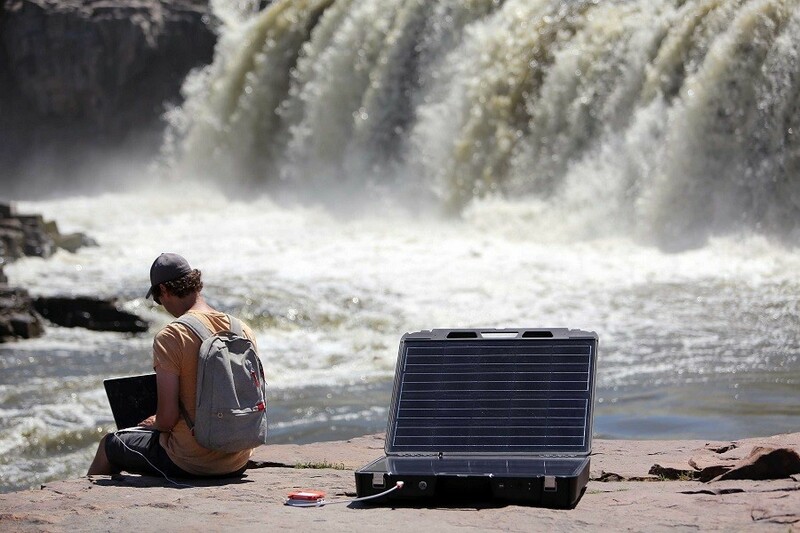 While expensive (about $2,000), this solar generator is perfect for anyone who needs a lightweight, highly portable and integrated package they can use on the go with a minimum of setup or fuss. 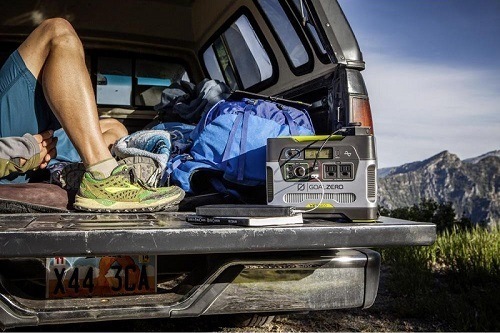 Whether you are camping on foot or just need a compact and reliable backup power source, the Sunsocket is an excellent choice. There are a few areas that could stand to improve on the Sunsocket. The unit is not waterproof, so you may have to baby it if you bring it along for an outdoor excursion that involves inclement weather. The price is also steep, with the unit costing three to four times more than other units with similar wattage output. 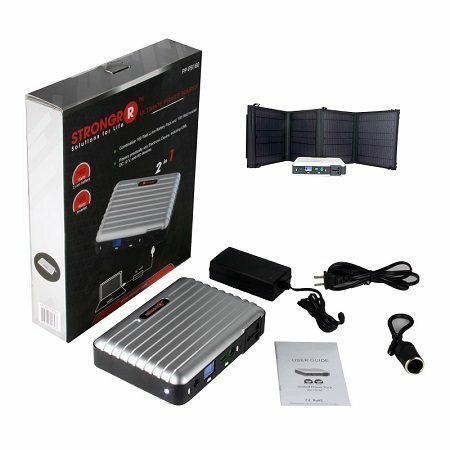 If you're looking to bring solar backup power along with you anywhere you go, this unit is for you. The built-in and collapsible panels are hard to beat for portability. There are plenty of collapsible panels available, but none that include the battery in the unit like this one. Having everything in one place is a precious luxury that can save you a lot of trouble when in the outdoor or on the road. Sure, the energy supply could be higher, but this unit can power all the essential smaller devices reliably whether the sun is fully out or not. This generator from PowerOak is a relative newcomer on the scene that seeks to harness the best aspects of the generators that have come before it, while also improving on them. The unit is totally silent, feature-rich and provides a reliable external power source for any situation. 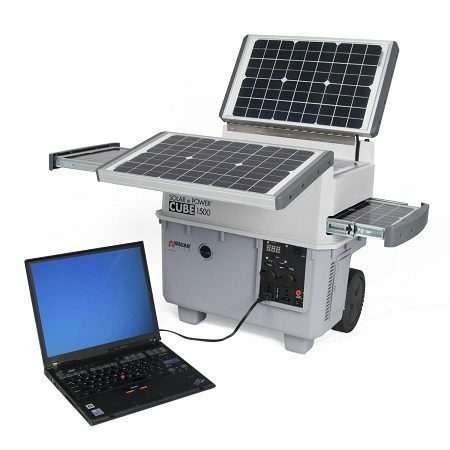 PowerOak's unit is full of useful features that makes it versatile enough for workshops, outdoors, and even offices. The generator is powered by a lithium Samsung battery, giving it a longer lifespan while also saving on weight. No need to worry about overcharging either – the built-in advanced circuit mode automatically shuts off upon charge completion. It also shuts down when the power supply gets below 10%, saving your batteries. 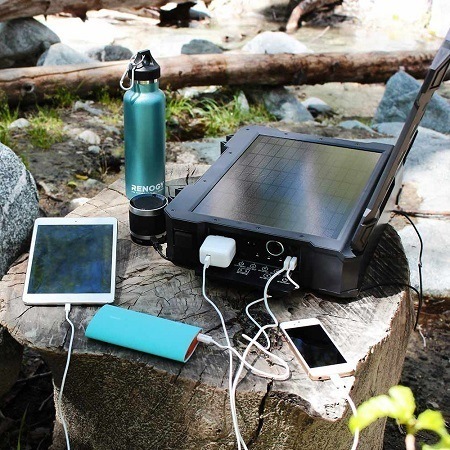 Like its predecessors, the PowerOak 400wh can be charged by solar, AC wall outlet, and DC 12v car chargers. The unit makes efficient use of solar panels when used, and can provide a full charge in as little as 5 hours when used with certain panels. The LCD display is useful and loaded with necessary information, such as remaining capacity, charge, discharge, and failure status. The display shows a segmented battery as it charges, providing an easy-to-read gauge as to how far along it is. The unit is incredibly light, weighing-in at 12.3 lbs. An AC wall charger, car charging cable, solar charging cable, and alligator clip for jump starts are all included with the unit. The PowerOak 400wh Generator's features make it appropriate for a number of scenarios. The unit's weight allows for easy transport to outdoor functions and campsites, and also makes it a good ally to have on the road with an RV or camper. The size makes it easy to store away as well. The unit includes the standard 12v an AC outputs, and the 4 USB outlets are useful for those wishing to charge multiple handheld devices like tablets and smartphones. 400 watts is enough to recharge plenty of phones and laptops, but it's not enough to power a fridge, microwave or heater. The unit also comes with no solar panels, so you'll have to find some on your own that are compatible with it. If you need a small and lightweight external power supply with multiple charging options, you will find the PowerOak 400wh a great choice. It is perfectly capable of providing power for your most essential devices, including most office electronics. The LED interface is simple and understandable for any level of user, and the included accessories provide everything you need charging-wise for any number of devices. You will need to supply your own solar panels, but even so this unit is a good value. Wagan's EL 2546 combines a bunch of portable generator features into one, and offers two to three times the power of similar generators. The all-in-one panels and generator team up to provide ample wattage for several mid-range appliances and devices. The first thing you'll notice about the EL 2546 is its built-in solar panels that each slide and fold out. This is a truly collapsible all-in-one unit that is capable of being expanded in several ways. The panels all tuck and fold away into the unit, which also include a collapsible handle, similar to rolling luggage. The two large wheels make it easy to transport the 84 lb unit, and its collapsibility makes it suitable for transport in several situations. The EL 2546's 1500 watt output makes it strong enough to power a whole slew of devices and appliances, giving it a leg up on some of the smaller generators in its class. The unit can accommodate additional panels and another battery, if desired. The storage bin located on the side allows for easy storage of all the necessary cables and connectors. The EL 2546 includes six total outlets: 2 USB's, 2 12v's, and 2 AC's. The unit can also be charged via 12v and AC connections. A full solar charge can take up to 18 hours. The EL 2546's increased wattage output makes it useful in any number of scenarios, both indoor and out. Campers and RV users will appreciate its ability to power televisions and small refrigerators for anywhere from 4-6 hours off a single charge. The unit's mobility makes it easy to bring along for any outdoor situation, and its collapsible design allows for easy storage at home when not needed. The large wattage output also makes the unit suitable for power outages at home, allowing you to power more than just your home's lights. The unit's large wattage capacity means it's going to be heavier than other units. At 101 lbs, you may need a little help lifting it in or out of a car or RV. The EL 2546 is also not waterproof, so an appropriately-sized cover should be acquired separately if you wish to keep it dry in outdoor situations when not using the panels. The larger capacity also results in a long charge time. Those that require a faster charge time will need to purchase additional panels. If you need a generator that powers more than just phones and lights, this unit from Wagan is perfect for your needs. 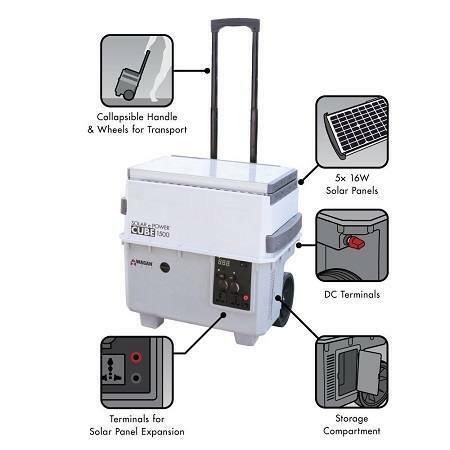 The unit is on the heavy side, but the collapsible features and easy transport once it's on the ground provides for an easy-to-use solar generator that has everything you need to be sufficient from just the sun. 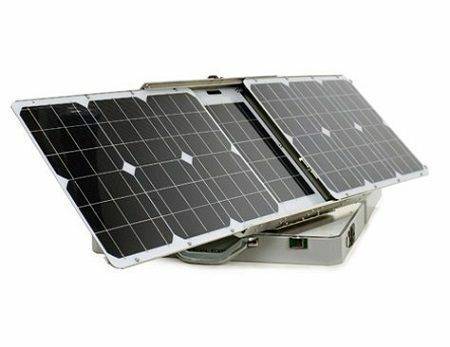 Whether you are camping or just want the added security of a capable solar backup for emergencies, the EL 2546 delivers the wattage you need. 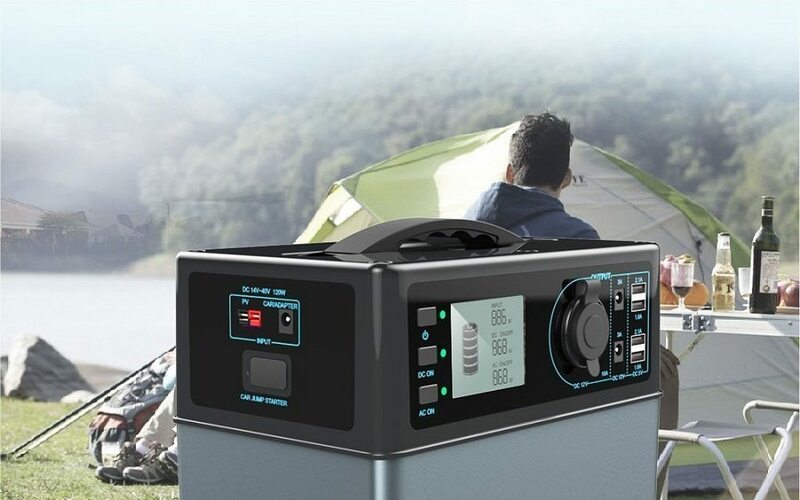 This generator from LB1 offers a lot of performance crammed into a much smaller package than other portable solar generators, making it a handy backup that is perfect for traveling. The PB160's features include both its many functions and convenient size. Weighing in at just over 5.2 pounds and measuring 6 x 8.5 x 5 inches, the generator unit is incredibly easy to transport, to say the least, and the panels fold up for easy transport and storage as well. Charging can be accomplished via the included solar panel, a 12v car charger, or standard AC outlet. It takes about 6-7 hours to recharge the batteries on AC/DC power. The LED display provides easy-to-read information concerning the power packs's charge status, as well as providing a handy flashlight in emergencies. The unit includes one of each major ports USB, 12v, and standard AC outlet. Since the unit's major perk is the size, the PB 160 is a suitable companion for backpacking, camping, or as a spare charging device during travel in RV's, campers, and even buses and subways. The panels collapse down into ta fair small size, not much bigger than the actual generator, so transport is not an issue. The unit is also a sufficient backup supply during outages. Due to the small size, the generator is not going to be able to power much more than a laptop or two. The solar panels themselves are not very powerful, either, resulting in an extended charge time compared to charging via an AC outlet or car charger. The convenience offered from the PB 160 is unparalleled as far as size and weight is concerned. If you mainly need to keep your phones, tablets, and laptops charged while also powering a light or two, then this tiny unit will make you very happy.